Pixel machine. Outsider - trailblazer? While the competition is equipping their high-definition luxury-range with Nvidia GPUs, the Japanese manufacturer relies on AMD's Radeon R9. Will the combination of a 4K screen, fast computing cores, build, and ergonomics result in a round bundle that deserves our purchase recommendation? Showy screen wanted? The Satellite P50t-B-10T is a candidate. Retina for the people? Over the past two years, an increasing number of manufacturers have been trying to gain a reputation with high-resolution screen models. Apple's MacBook Pro 15 Retina kicked things off in mid-2012, and today there are dozens of all-rounders; workstations, and subnotebooks that want to show off with 2560x1440, 2880x1800, 3200x1800, 2880x1620 or even 3840x2160 pixels. The latter is installed in our review sample, and therefore it has one of the sharpest screens that are available in laptops. Our Satellite P50t-B-10T faces the following competitors (all 15.6-inch, resolution > FHD): The Dell XPS 15 with a top rating of 88% in our test, and a GT 750M, is well-equipped even for gamers. The Thinkpad T540p (86%) belongs to the higher price range at 1800 Euros (~$2228). It is however one of the weakest with a GT 730M and 2880x1620 pixels. Lenovo offers the Y50 (82%), an alternative for gamers due to the same resolution as our review sample, but with a GTX 870M in its casing. The MSI GS60 Ghost (2880x1620 pixels) also adds a GTX 870M to the comparison, but it only achieved a rating of 80%. Which one of these is the most compelling alternative? Or does Toshiba provide the best price/performance ratio? The answer can be found in this review. 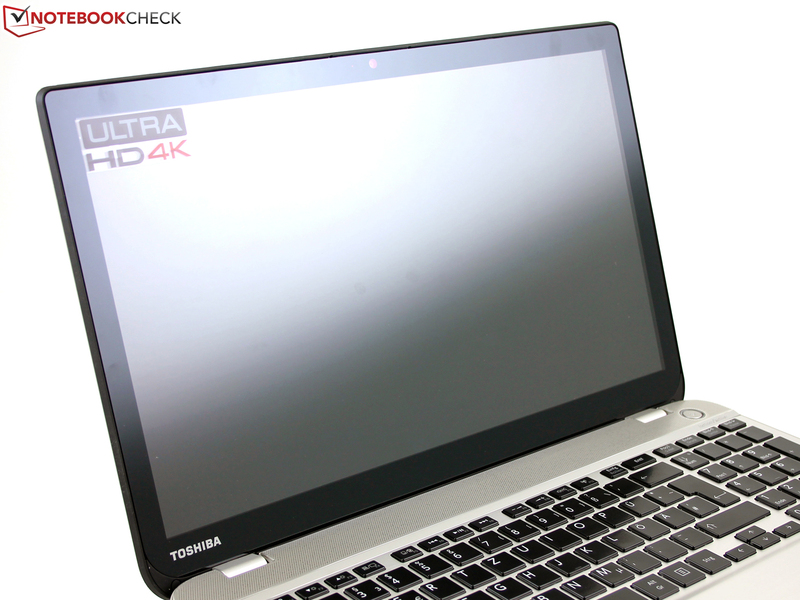 At first glance, it might seem as if Toshiba is using the same chassis as the Satellite P50-A-11L that we tested during late 2013. This is not the case though. The VGA out on the right has been removed, and a GeForce GT745M no longer ticks inside. Both points indicate a modified motherboard layout. As before, the base features a glossy, brushed aluminum finish. The plate gives a high-quality impression thanks to its pressure resistance and cool metal feel. The underside is made of corrugated plastic that clearly yields under the typical weak point, the optical drive. We discovered a few rough edges where the base's silver frame meets the bottom tray (glued). This is different on the lid. 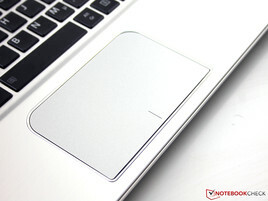 The curved edges of the aluminum cover close neatly around the edges. A rubber lip surrounds the screen, and closes flush with the wrist rest. The lid's aluminum back provides good pressure resistance. However, it can be twisted to a certain degree diagonally. The aluminum-covered hinges are not solid, but they have been fitted tightly to the base. Both hands are needed for opening. The heavy display unfortunately wobbles after shocks, which can have adverse effects when using the touchscreen. The positioning of the HDMI, USB 3.0 port, and microphone/headphone jack on the right front leads to a big cable mess. The rear cannot be used for interfaces due to the screen's mount. Other manufacturers prove that this is not necessary. For example, Acer's Aspire V5-573G has almost all its ports on the rear, which looks very good on a tidy desk. In addition to the compulsory Ethernet port (Realtek RTL8168/8111 Gigabit LAN), the P50t is equipped with Intel's Wireless-AC 3160 for a wireless connection with our Wi-Fi router (Fritz!Box 7490). The P50A only featured Wireless-N. The module performed inconspicuously and reliably in the test. We received a signal in both short distance (15 meters; ~49 ft, outside the building, 1-2 bars) as well as a longer distance of approximately 45 meters (~148 ft; 1-2 bars). However, a clear speed decrease was noticed in the latter case, when opening Notebookcheck.com. The lid's aluminum cover might be the interference source for the Wi-Fi antennas. They are however located in a narrow plastic bar at the very top of the display. 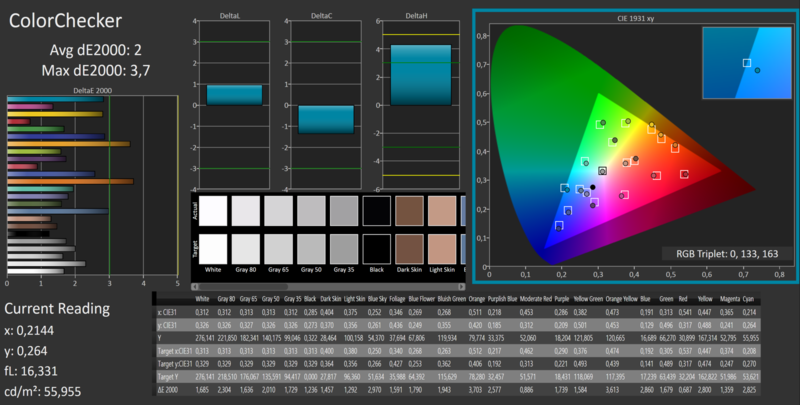 Chroma Tune sets predefined color profiles (cool, warm, rec 709, full, Technicolor). We used Technicolor for the CalMAN assessments. CyberLink MediaStory tries connecting to various media on the PC and in the network via Social Media. Eco Utility is a classic from Toshiba, and allows monitoring the power consumption. The media player by sMedio TrueLink+ is a player that has been visually optimized for touch control - a must-have for a laptop with a Blu-ray drive. PC Health Monitor and System Settings facilitate hardware administration. 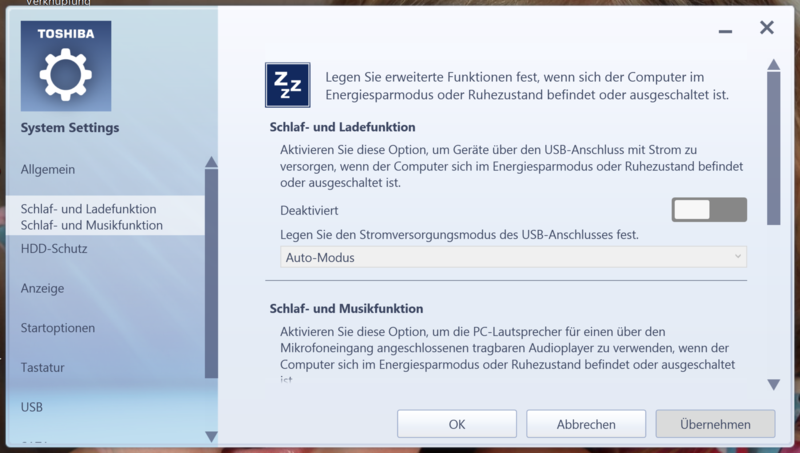 Users do not have to disable devices via the BIOS. As usual, Toshiba does not include many accessories. Only a brief user's manual and quick start guide are found as well as the large 120 W power supply (555 grams;~1.22 lb). Maintenance is secondary in the Satellite. The "sealed" battery is almost audacious. 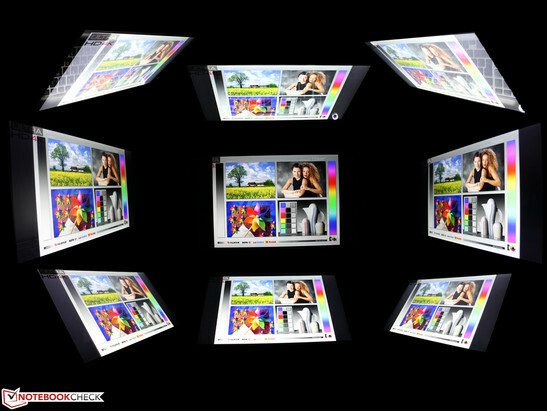 More and more manufacturers are following this practice, and it is not only limited to especially slim devices. Toshiba only installs a small maintenance hatch for the working memory. The screws are found under multiple rubber stoppers which would allow opening the base plate. We did not do this to avoid damaging the shop sample. We believe that the innards' layout will be very similar to that of the Satellite P50-A-11L, and therefore refer to that review for interior screenshots. Toshiba includes a 24-month limited warranty ex-factory with an international bring-in service for Europe, the Mid East, and Africa. 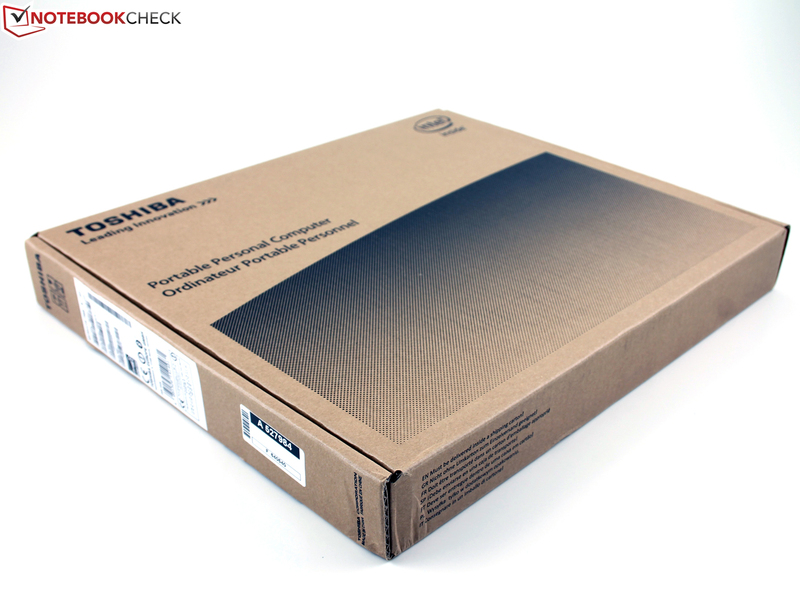 The manufacturer offers an on-site pick-up service when a repair is registered via Toshiba's notebook hotline (Germany and Austria). 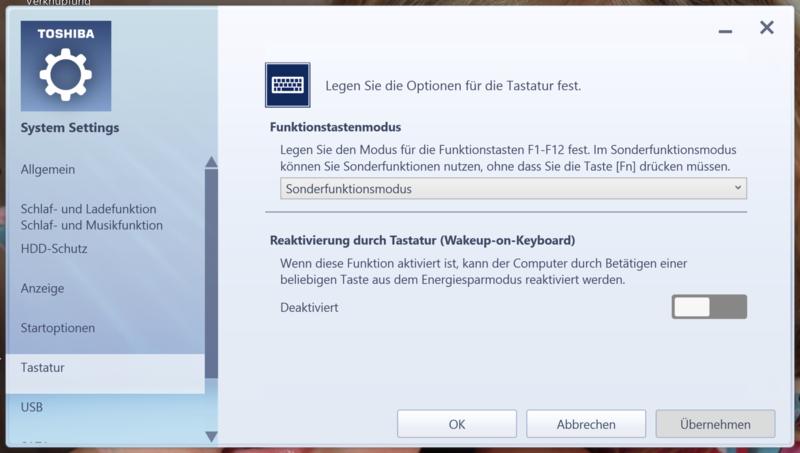 Apparently the keyboard has not been modified since the Satellite P50 from late 2013. The layout uses the entire width of the 15-inch laptop, and includes a full-blown number pad with large keys. Toshiba has optimized the substructure, and we are no longer faced with a soft, spongy stroke. The stroke is firm, but not hard. The sleek keys are quite slippery for the fingers, which is, however an advantage for fast typing. The typing noise is very quiet, and the crisp pressure point provides a distinct feedback. This, as well as the medium drop, leads to an agreeably clear feedback that mechanical keyboards do not achieve because of their short drop. 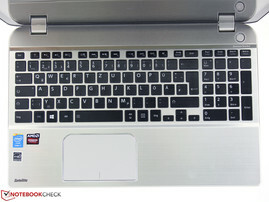 The ClickPad also makes a better impression than its predecessor. As before, the drop is still short and even non-existent in the upper area. However, since clicking only needs little force, and responds with a sufficient pressure point, working on the matte surface proves to be quite pleasant. Nevertheless, perfectionists will find the pad sluggish due to the short drop. Multi-touch gestures work impeccably. The Synaptics ClickPad V1.2 can be customized to the needs of the user in the driver. For example, swapping windows via edge swipe as well as the four-finger flick (swiping upward) are possible. The capacitive 10-finger multi-touchscreen works without any problems. Despite the high resolution, the finger almost always finds the smallest buttons and check boxes. The touch surface yields slightly when pressure is applied, but does not impair its use because, like most touchscreens, gentle tapping is enough to trigger a reaction. The screen is sensitive up into its edges, and moving windows is still almost 100% possible when sliding a finger along the black frame. Toshiba has installed an unusual 16:9 screen in its 15.6-inch laptop: 3840x2160 pixels (LQ156D1JX01) bring the so-called 4K resolution to the desktop (pixel density: 282 ppi). 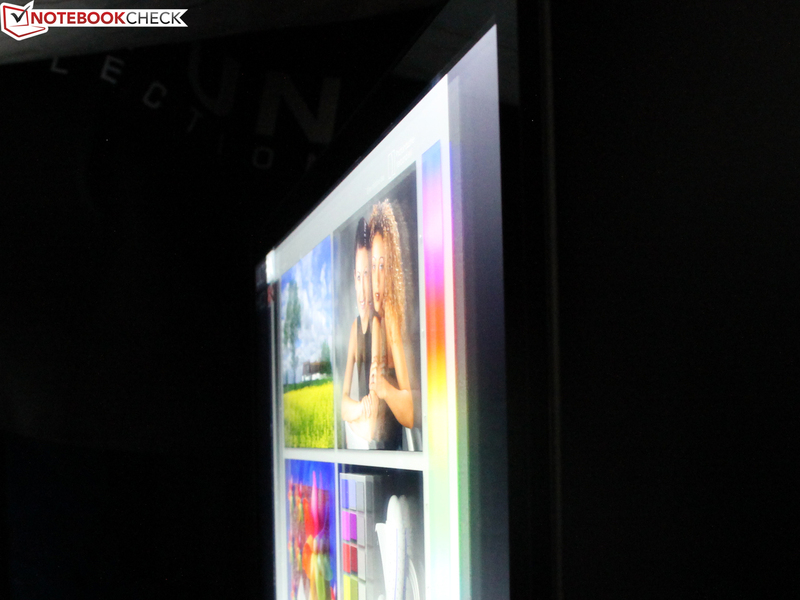 The screen is also a capacitive 10-finger touchscreen. 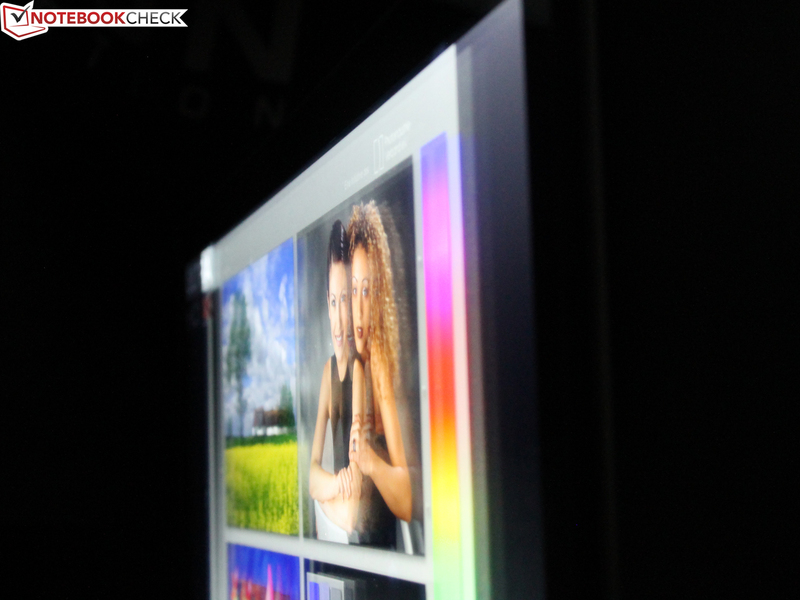 The manufacturer states a "high brightness touch display", which our measurements did not confirm. The average brightness of 248 cd/m² does not belong to the upper class. 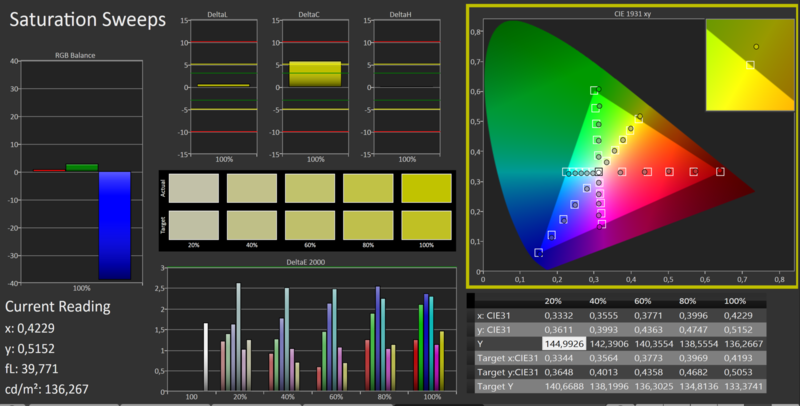 The competitors offer a higher brightness (see chart). The brightness is distributed evenly over the screen, and we only observed marginal screen bleeding at the edges, even on a black screen and maximum brightness (screenshot on the right). 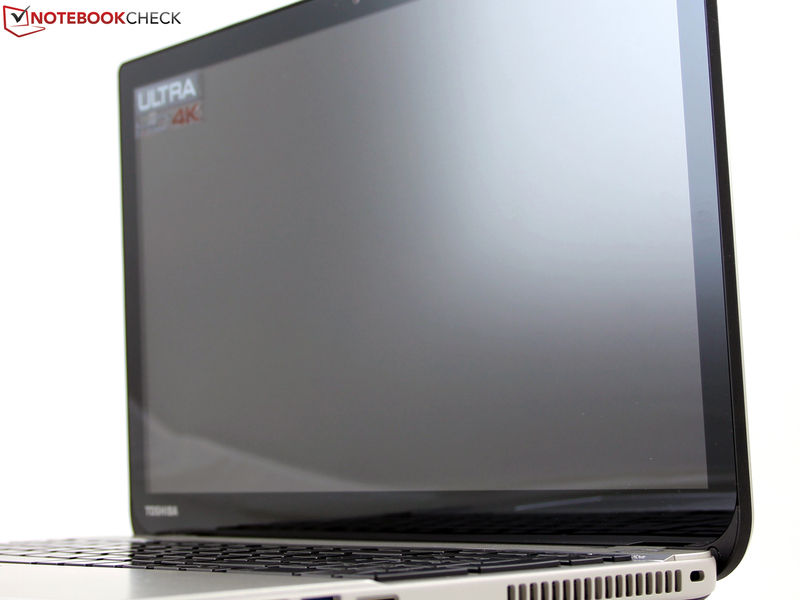 The P50t version is only available with the 4K touchscreen. The P50-B models with 1920x1080 pixels (glare, IPS, Radeon R9 M265X) are available at a starting price of just under 1000 Euros (~$1238). The IPS screen is already spruced up in state of delivery by a color profile (Technicolor), which results in a strikingly good color reproduction. DeltaE 2000 rates of 1.6 or 2.4 make calibration superfluous. 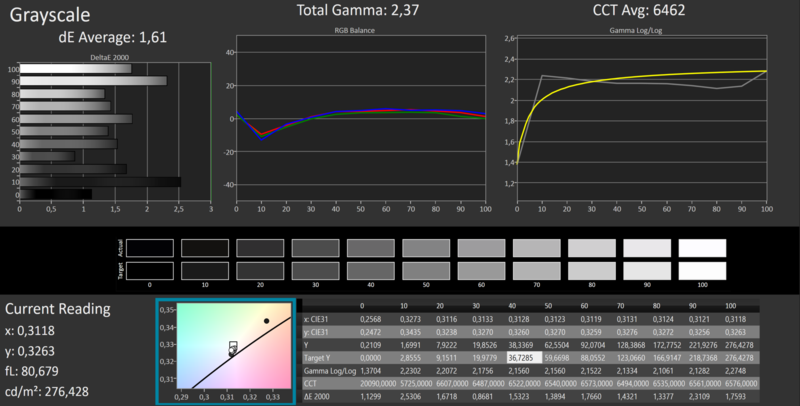 The analysis with CalMAN shows that although the sRGB color space is not completely covered (92% - Correction 20.5.2015 due to a wrong sRGB-reference-profile), colors are rendered naturally. 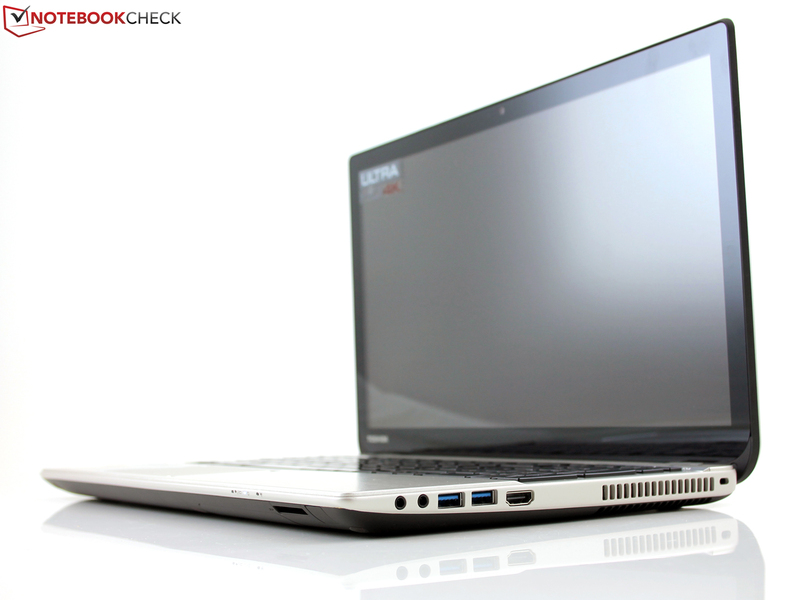 Only MSI's GS60 provided this perfection among the competitors. The contrast is in the top range, and on par with Dell's XPS 15: We rarely see 1400:1, which is based on the black level of 0.18 cd/m². 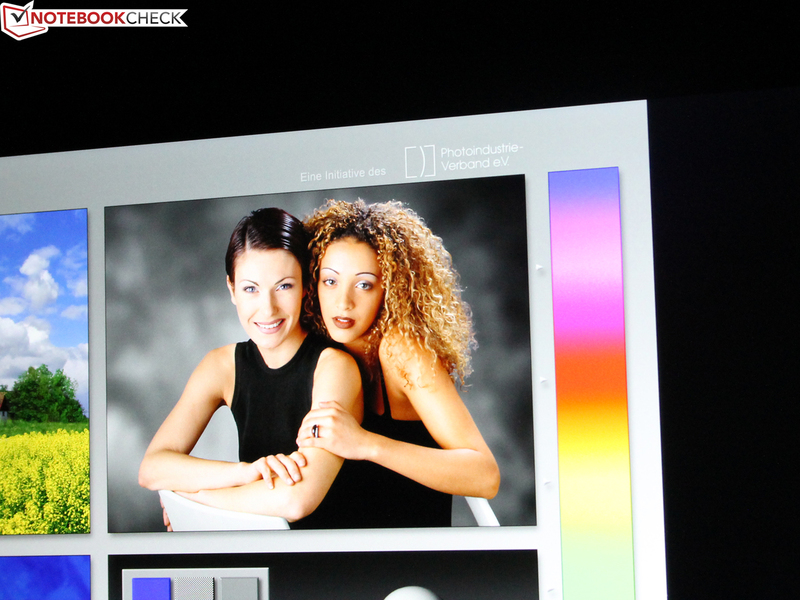 Chroma Tune makes switching between the color profiles easy, for example, when an application looks better in cooler colors. 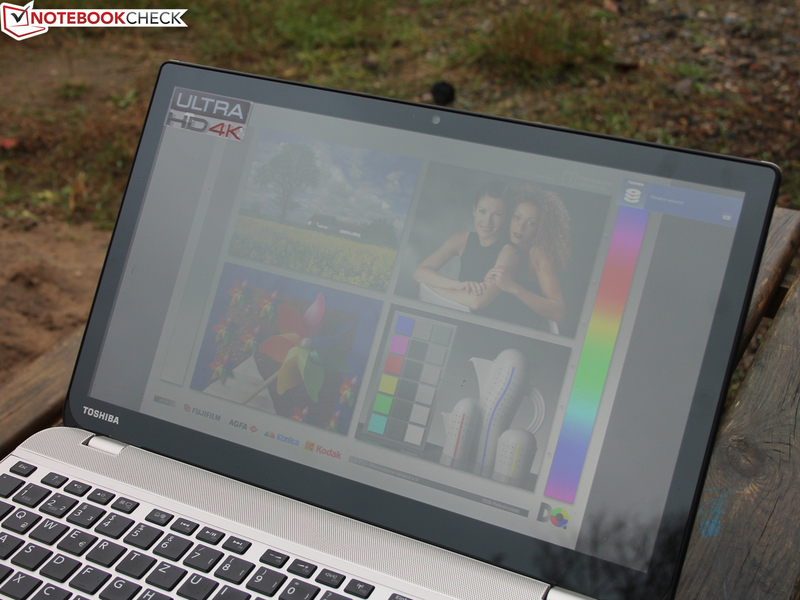 A laptop screen cannot offer more than our review sample in terms of colors. 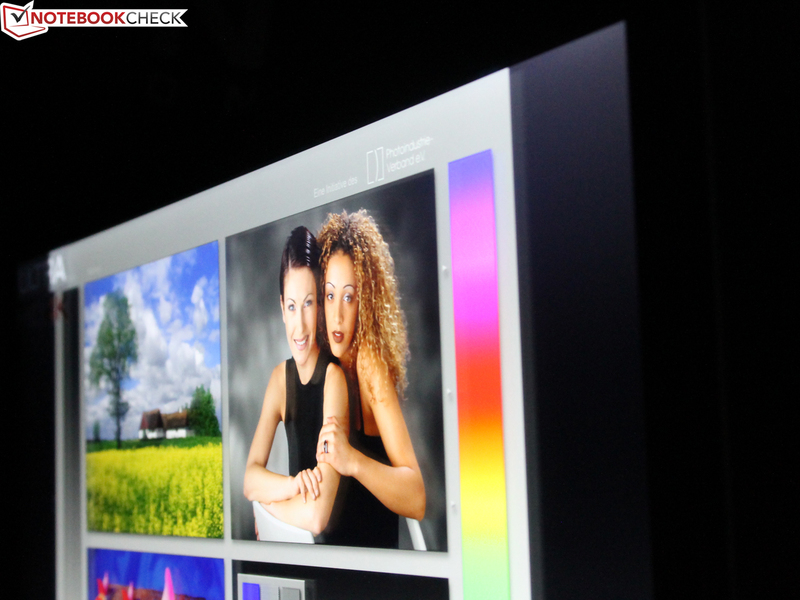 There are so-called Dreamcolor displays that almost completely cover sRGB and AdobeRGB in the workstation sector. 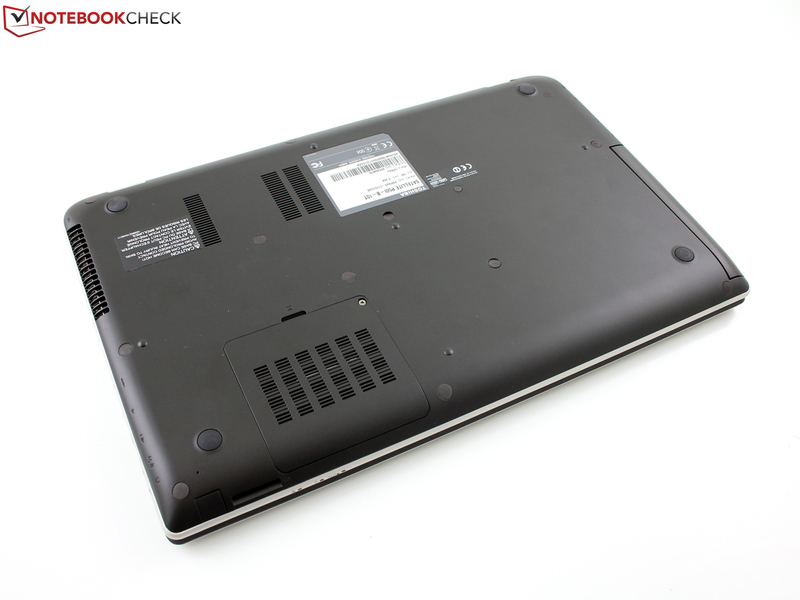 An example is HP's ZBook 17 (E9X11AA-ABA) that also offers a matte FHD (display rating: 92%). The screen is not quite as impressive outdoors, which is primarily due to its reflective characteristic. However, the imperfect brightness is also a factor. The brightness is throttled to 117 cd/m² in battery mode (measured in the center). It often helps to disable the ambient light sensor and/or the HD graphics energy saving profile in most laptops, but this does not have any effect in the P50t. Outdoors in cloudy conditions - the maximum brightness is not available here. The brightness is throttled to 117 cd/m² in battery mode. Turning of the Intel HD energy saving functions did not have an effect on dimming. As is typical of IPS screens, the viewing angles are very good. No matter from which side we looked at the screen, the contrast remained stable (no inverting). Colors only distorted in extreme angles from above. The competent combination of a standard Haswell processor (not low-voltage; TDP: 47 Watts) and a dedicated Radeon R9 M265X (upper mid-range) bring strong all-rounder qualities for various applications on the desk. The lack of a real SSD, preferably combined with an HDD, is too bad, considering the 1500 Euro (~$1857) price range. The manufacturer relies on a solid state hybrid drive (SSHD) dubbed Toshiba MQ01ABD100 (1000 GB; 870 available in state of delivery). Intel's Core i7-4710HQ (2.5 GHz) is a popular Haswell processor for performance-oriented gaming laptops, all-round devices, and workstations. Some rivals use identically built or very similar CPUs. The SoC's Turbo is 3500 MHz (single-core) and 3300 MHz (multi-core) provided the cooling mechanism is strong enough to keep the temperatures on the SoC under control. This does not seem to be the case at first, as can be seen in the screenshot of the Prime95 CPU stress test. 2.8 - 2.9 GHz are available under consistent multi-core load, although the package does not show overheating at 82 degrees Celsius (~179.6 °F). 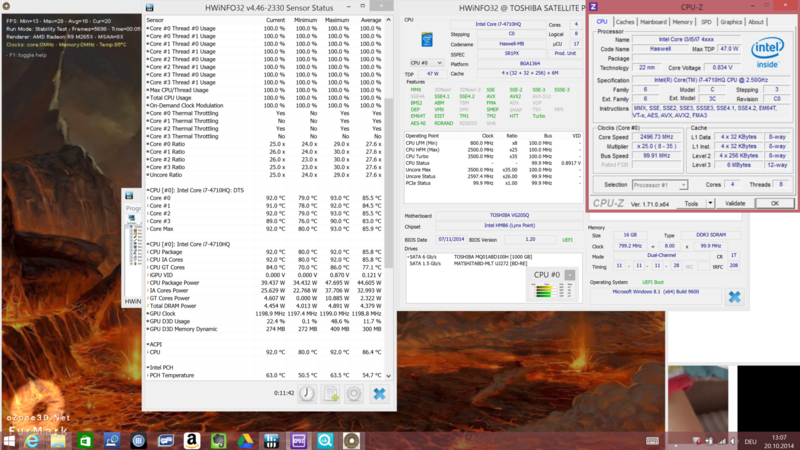 Both MSI's GS60 and the IdeaPad Y50-70 feature an identical 4710HQ and are on par in Cinebench R15 Single. 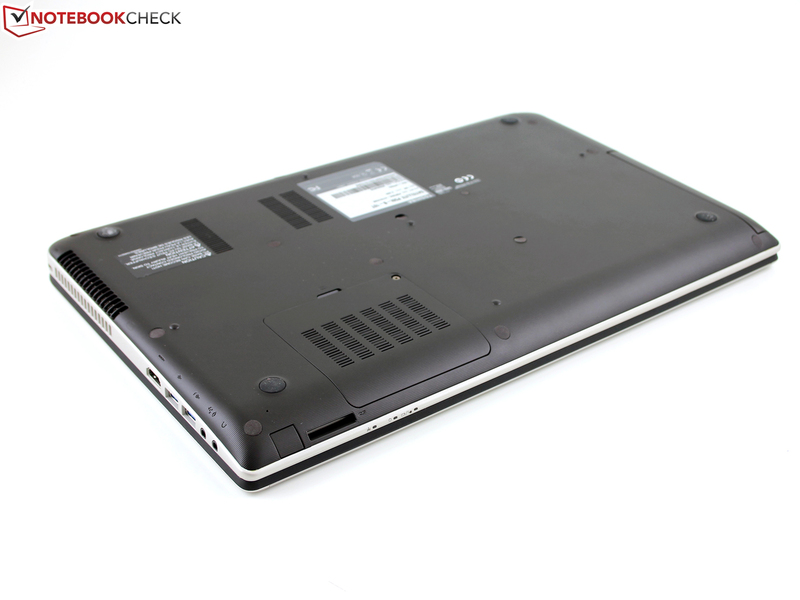 Differences are seen in the Multi test where the GS60 takes the lead (7%) and the IdeaPad Y50 lags behind (-17%). These differences are too low in total to be a decisive purchase factor. On the other hand, the Radeon runs stably at 625 MHz. 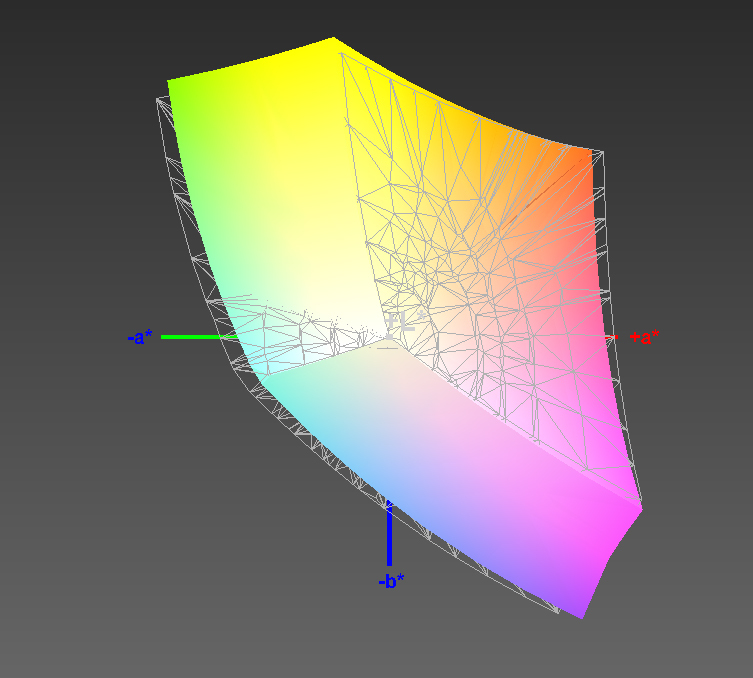 The screenshot displays simple load via FurMark. 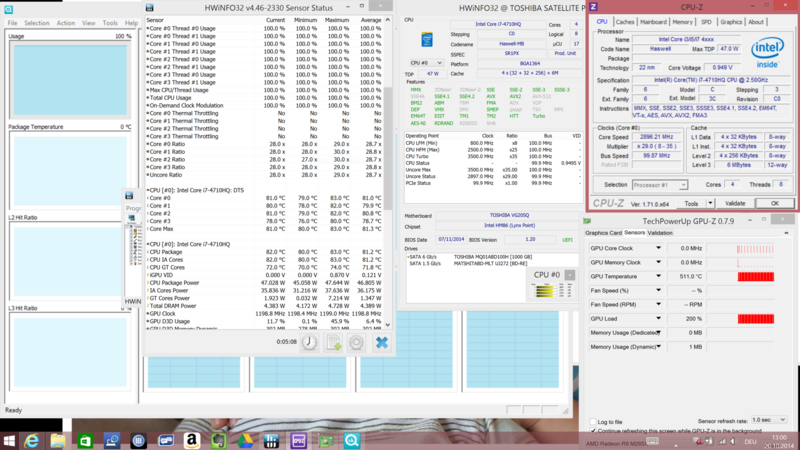 It also shows the processor's idle temperature range (69-92 degrees Celsius; ~156.2-197.6 °F). We also performed the R15 test in battery mode using High Performance, and found performance throttling in both the CPU and Radeon R9. The R15 Multi test dropped to 402 points (AC: 611), and R15 OpenGL dropped to 45.5 fps (AC: 59). The reason for the performance decrease in battery mode became obvious in R15. The clock strongly fluctuated between 800 MHz and 3.1 GHz (AC: 2.8 - 2.9 GHz). Programs such as PCMark 8 assess the application performance and run real applications for several hours. We have not recorded the PCMark 8 Home Score of all competitors. However, it proves that the SSHD in the P50t is apparently not a drawback compared with the Thinkpad T540p (SSD) and MSI's GS60 (RAID SSD). The System Storage of the older PCMark 7 naturally sees this differently, and these laptops take a lead of 68 and 74% respectively. 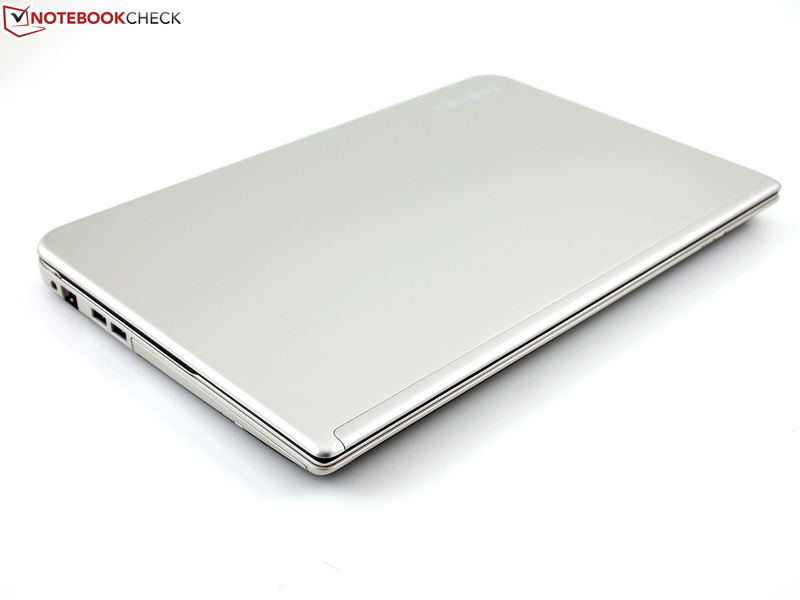 The competitors are closer in the Total Score of PCMark 7; the lead of the GS60 shrinks to 23%. The Computation Score of MSI's GS60 (+30%, identical CPU) is another indication of the weaker performance of the processor in our P50t. We have rarely noticed longer program load times, or system boots compared with SSD laptops (cold start: 16 seconds to login). However, installing and copying processes took considerably longer. The 8 GB SSD cache (MLC-NAND) "remembers" frequently used sectors and keeps this data ready for quick access. Toshiba's MQ hybrid drive (retail price of just under 80 Euros; ~$100, MQ01ABD100H) does not fare quite as well as SSD laptops in reading, but the results are impressive for a hard drive. We added the Satellite P50-A (HGST Travelstar, 5400 rpm) for comparison. The 4K read and write in particular, benefit from the hybrid drive's cache, which might be a reason for the system's solid performance. AMD's Radeon R9 M265X belongs to the upper mid-range and is the counterpart of the GT 750M or the GTX 850M (DDR3). Until now, Toshiba has been the only manufacturer that gives the Radeon a chance in its Satellite S70-B, L70-B and P50. 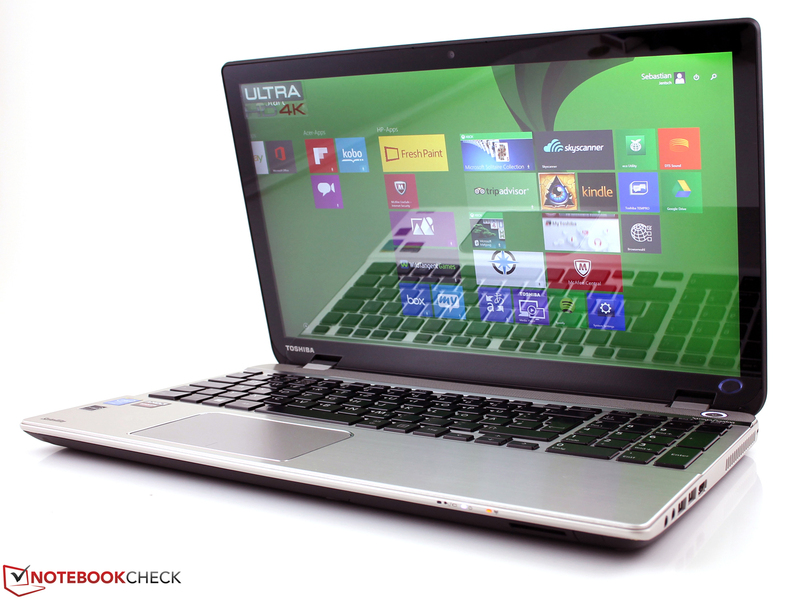 An extensive gaming test can be found in the review of Toshiba's Satellite L70-B-130 based on the same CPU. The core's clock rate is 635 MHz, and should theoretically achieve a boost up to 900 MHz. However, we never experienced this during the test (not even in the Satellite L70-B). GPU-Z has 2 GB of GDDR5 video memory (128-bit). The scores achieved in 3DMark 2013 are just 25% behind the GeForce GT 750M (XPS 15). Only the old GT 730M is clearly defeated. Gamers will naturally be jealous of the GTX 860M and 870M, which are easily 120% to 190% faster. These GPUs belong to the mobile upper class. Gamers who want high details will not be satisfied with the Radeon R9 M265X. "High" details mean 1366x768 pixels in most of our gaming benchmarks. The Radeon almost always has coped with that. Full HD (max.) or even the native 4K resolution were two sizes too big for the AMD chip. A GTX 870 would be needed to render FHD smoothly in ultra-settings. 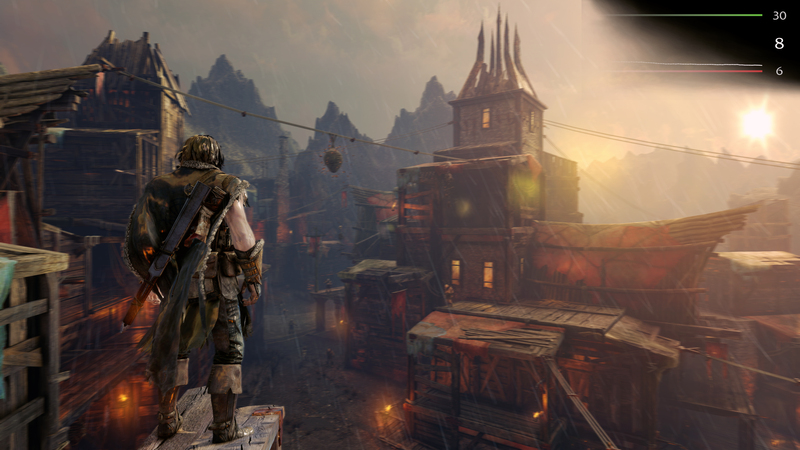 We tested Middle-earth: Shadow of Mordor by playing the in-game benchmark in the 4K setting, and only achieved 8 fps in medium quality. 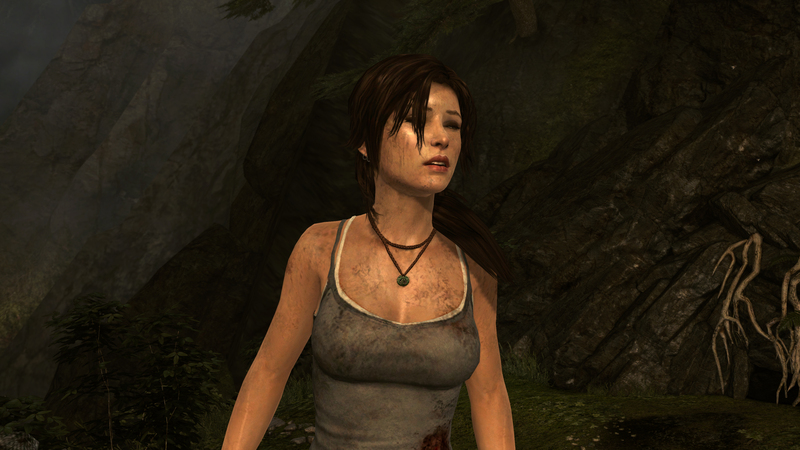 The same was true for Tomb Raider with 12 fps (default quality) and Thief (7 fps, low quality). Users looking for 4K gaming will not find it in Lenovo's Ideapad Y50-70 with the same resolution and stronger GPU either. But this gaming machine can at least usually deal with FHD using maximum details. The idle noise development was restrained, although the fan was rarely disabled. It spun with consistent 33.4 dB(A), which we perceived as a reverberating noise most of the time. The hard drive also produced an audible noise of more than 33 dB(A), but it did not clack. The level climbed to 44.5 dB(A) during load, no matter whether 3DMark 2006 or the stress test via Prime95 and FurMark was running. Some competitors are considerably quieter while idling; the fans of the IdeaPad Y50 and XPS 15 are even inactive for longer periods. However, laptops with stronger GeForce GPUs are louder in load. The temperatures during little or idle operation are low with almost 33 degrees Celsius (~91.4 °F) on the warmest spot. The average on the upper side is not even lukewarm with 28 degrees Celsius (~82.4 °F). The GPU machines among the competitors come in last here: MSI's GS60 reaches up to 50 degrees (~122 °F) on its top (78 °C; ~172.4 °F on the underside! ), and the Y50 produces 61 degrees Celsius; ~138.2 °F (59 °C; ~141.8 °F upper side). 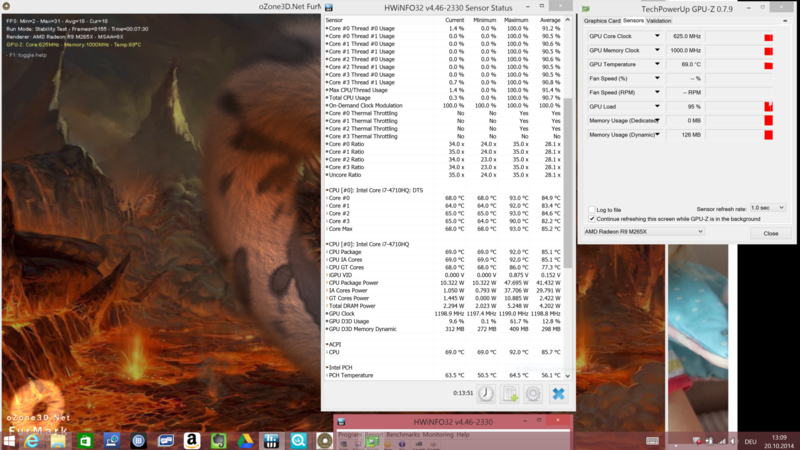 The P50t performed the stress test with 92 degrees Celsius (~197.6 °F) on the CPU. The clock fluctuated just above the nominal frequency (2.5 - 2.7 GHz). A short look at the power consumption shows that it dropped from 120 to 99 Watts after 30 seconds at 92 degrees Celsius (~ 197.6 °F). This was repeated again and again, and might be associated with the fluctuation between 2.5 and 2.7 GHz. The Radeon did its job stably in the stress test with consistent 625 MHz. (±) The average temperature for the upper side under maximal load is 32.1 °C / 90 F, compared to the average of 30.9 °C / 88 F for the devices in the class Multimedia. (±) The maximum temperature on the upper side is 43.5 °C / 110 F, compared to the average of 36.5 °C / 98 F, ranging from 21.1 to 71 °C for the class Multimedia. (+) In idle usage, the average temperature for the upper side is 25.4 °C / 78 F, compared to the device average of 30.9 °C / 88 F.
We were pleasantly surprised by the speakers' sound quality. Harman & Kardon has been cooperating with Toshiba for quite some time now. Although the P50t does not have a subwoofer, the two stereo speakers do not produce a thin or tinny sound. 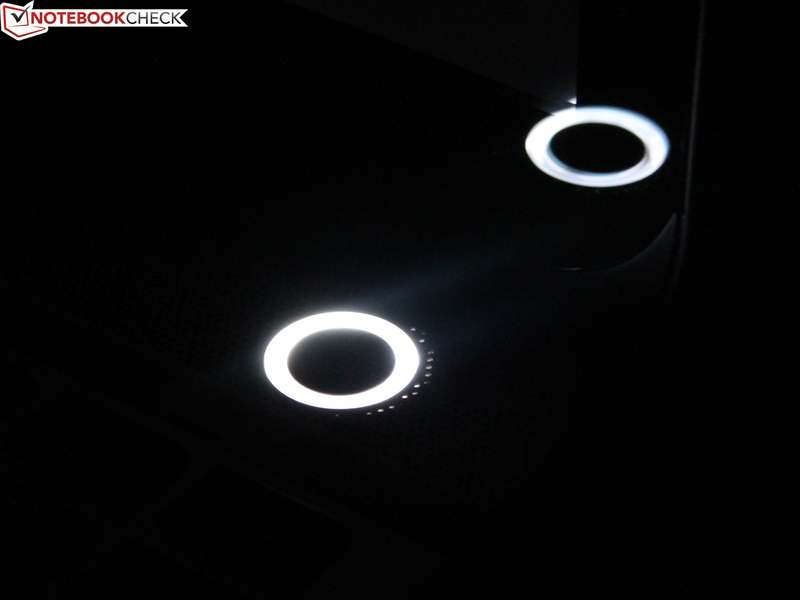 They are located directly below the display, beneath an aluminum grille. The user will hear a powerful sound with a hint of low ranges and a very good maximum volume that will support the acoustic effects in movies and games. The power consumption of our review sample is largely on par with that of the other competitors. A very similar power consumption was always measured while idling. Our P50t consumed 13 to 19 Watts while idling. 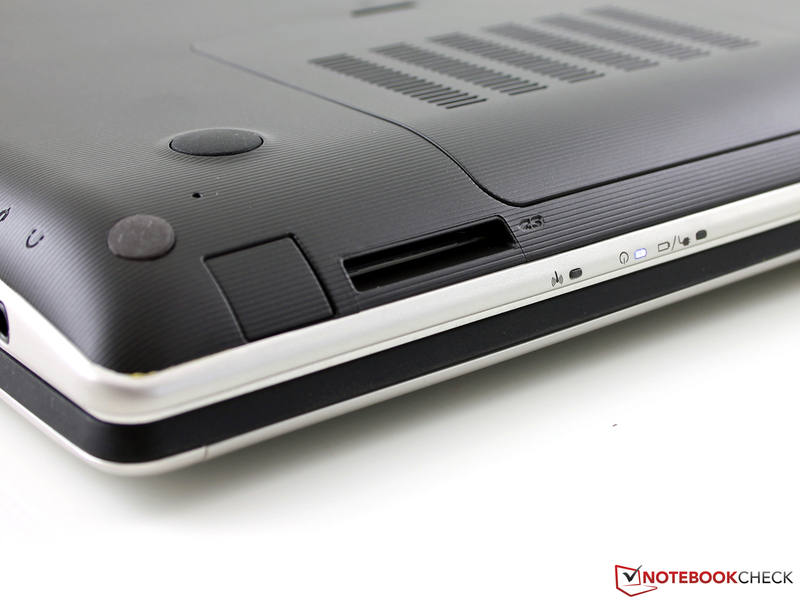 The Ideapad Y50 does a slightly better job despite its stronger GPU. TheY50 can use Nvidia's Optimus, which is the counterpart of AMD's Enduro. That means that the processor-integrated graphics takes over computations in idle or low load. The other competitors also make use of this. The P50t proves to be relatively frugal in load. The GeForce laptops consume considerably more energy, but they also have significantly more graphics power under their hood. The heavy power supply has an output of 120 Watts, and can just cope with the full load power consumption that ranges from 99 to 120 Watts. It needs 2:39 hours to recharge a fully drained battery in idle. The battery life is one of the worst in the category. Our script ran through the web for only 2:32 hours using a low brightness of 117 cd/m² (maximum, set by system in battery mode). 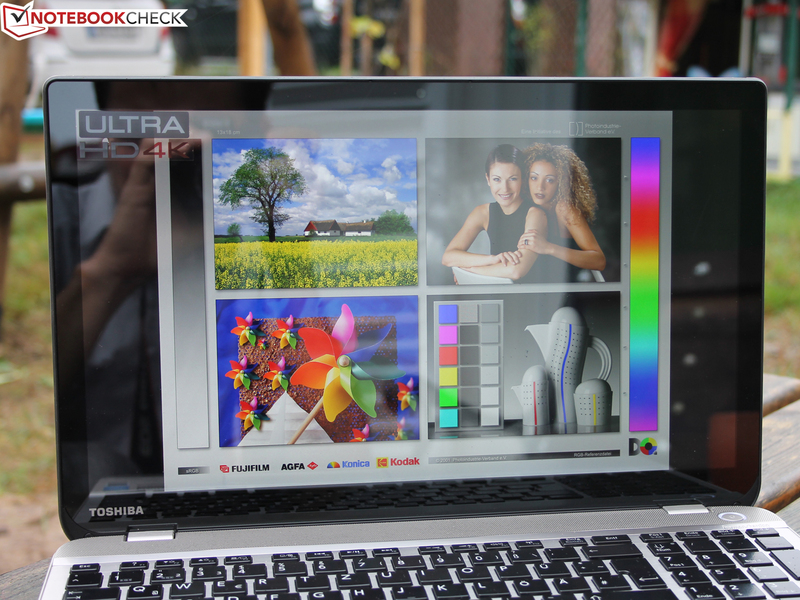 Even Lenovo's IdeaPad Y50-70 looks better with 100 minutes more. The reason is found in the battery's low capacity of 44 Wh. The XPS 15 can serve with 91 Wh, and the Ideapad Y50 with 54 Wh. 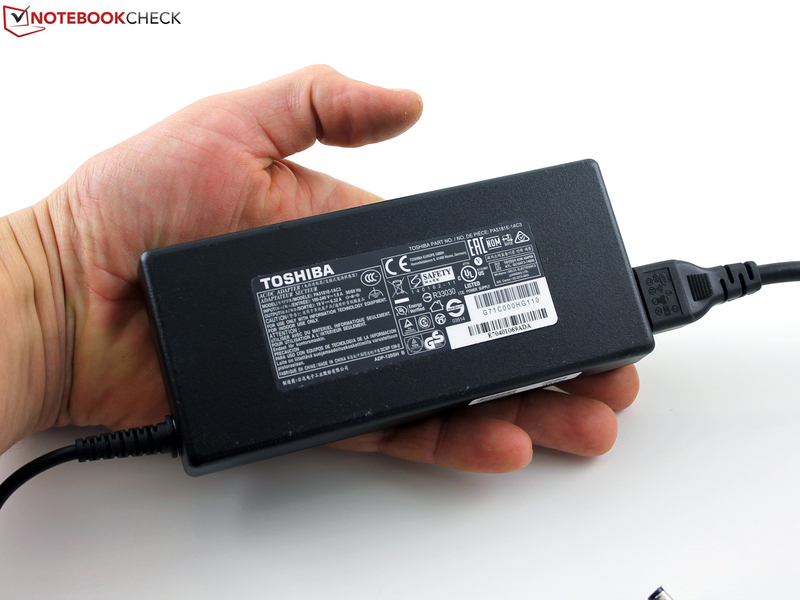 This might be called unfair, but the low capacity is ultimately Toshiba's own fault. 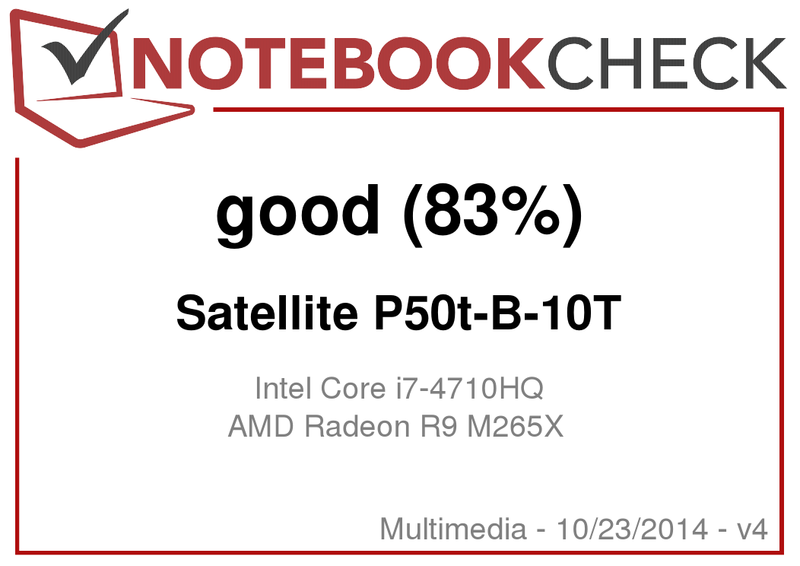 Satellite P50t-B-10T: The 4k screen is awesome, but the Radeon R9 M265X already has problems with FHD. Toshiba has a high-quality, 15-inch laptop in its line with the Satellite P50t-B-10T that not only pleases with its 4K resolution. The quality of the aluminum finish provides a pleasant feel, and the input devices have a surprisingly strong feedback. We did not expect this at all from a Toshiba consumer device. The overall performance is better than what we are used to from an HDD system. The relatively fast SSHD ensures that. The processor is very powerful, but we had the impression that it could not use its Turbo potential to the full extent in this chassis. We see AMD's R9 M265X with mixed feelings. 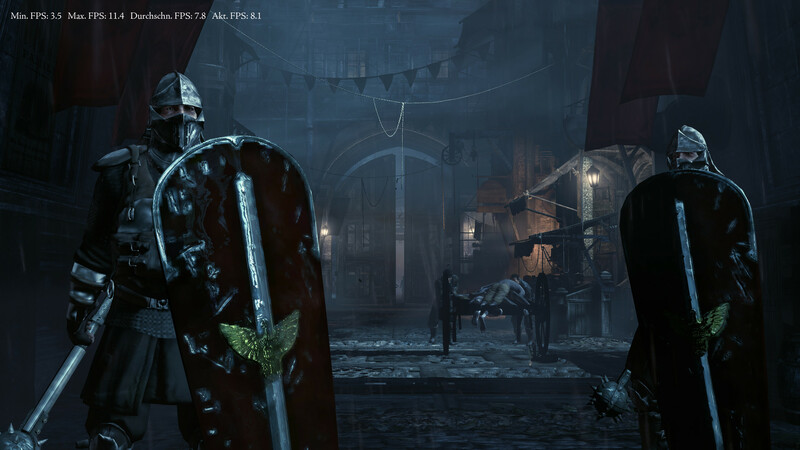 Users who do not want to play in FHD or 4K, or are casual gamers will be happy with the gaming performance. Anyone expecting more than that, will find better graphics cards in the form of GTX 860M and 870M in equally priced competitors. However, some drawbacks have to be considered: The maintenance options are just as limited as the short battery life. 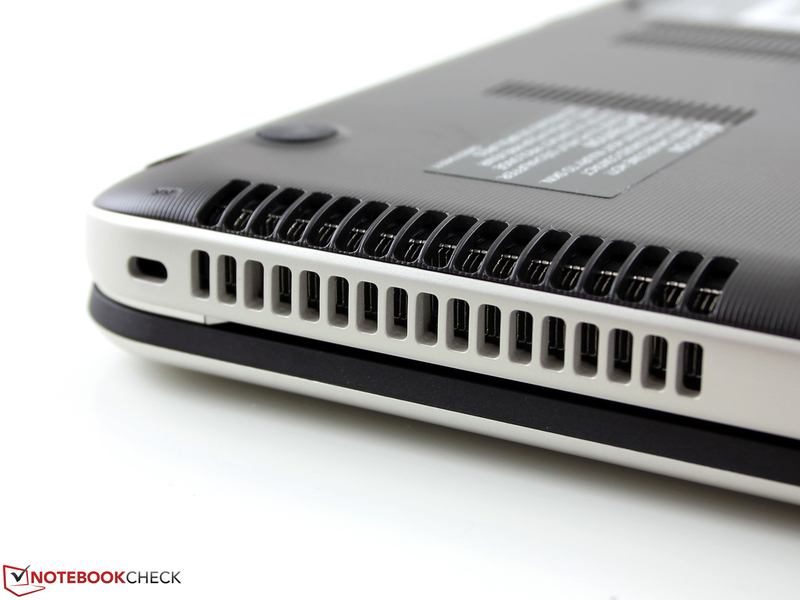 Users will have to deal with masked screws in order to replace the battery or hard drive. The Satellite has been made for people looking for a high-performance laptop that looks good and has a first-rate screen. Apart from the screen's glossy surface, the P50t is even suitable for serious computer work in view of its very good input devices and low emissions. Toshiba might offer the best screen, but it does not offer the best performance/price ratio. A large SSD, or even better yet, an SSD module and hard drive would have to be installed for that. Lenovo's Y50 provides exactly that with a 512 GB SSD alongside a powerful GTX 870M for the same price. 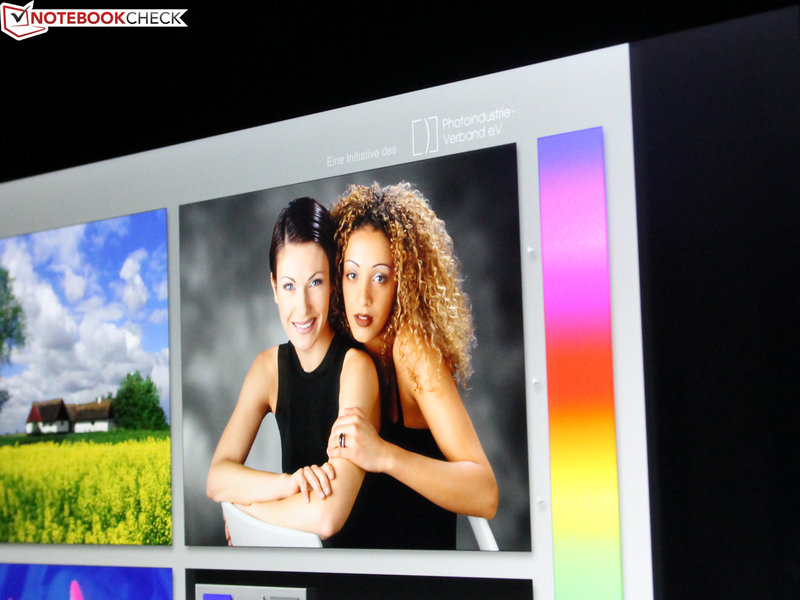 The screen also has a 4K resolution. MSI's GS60 Ghost is slightly more expensive, but its GTX 870 has a real chance to render games in 2880x1620 pixels (3K). Unfortunately, its power supply is too small and a few other drawbacks gnaw on the GS60 Ghost's rating. Bland boxing but technical highlight? ...in a paltry box on purpose. 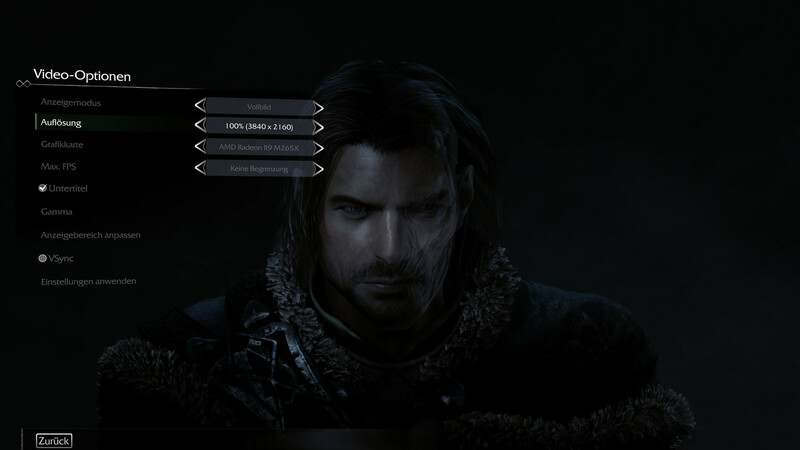 ...but it features a gigantic resolution of 3840 x 2160 pixels for that. Being gamers, we used this right away. 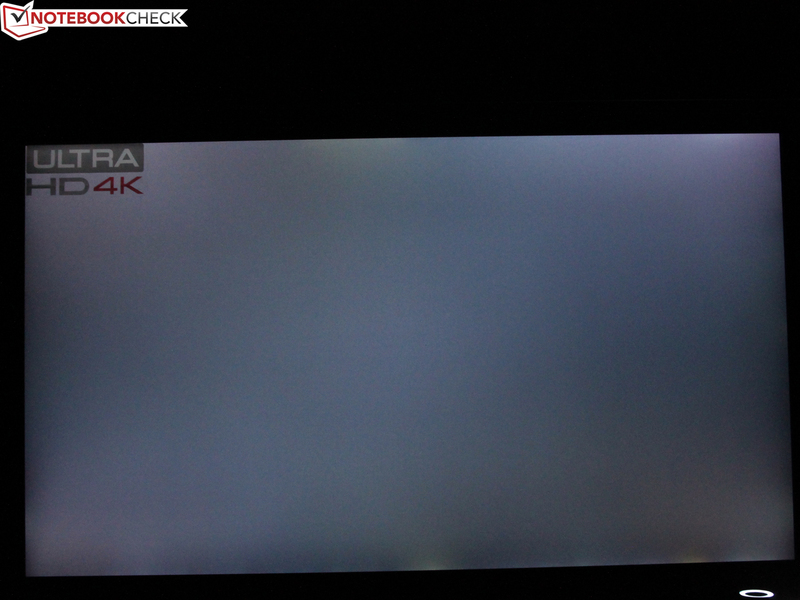 Unfortunately, the Radeon R9 M265X is already exhausted in Full HD, not to mention 4K. Multi-touch and IPS with first-rate viewing angles and colors? ...with a low DeltaE of less than 2.0 in state of delivery. The contrast of 1380:1 is very high and the viewing angles are very wide. The ideal screen for both professionals and consumers? Not quite. The glossy touchscreen is annoying in daylight, and the brightness could be higher for this purpose. A high-performance Core i7-4710HQ provides the computing power of a workstation. Thermal throttling occurs under permanent load. The fan spins loudly, but is agreeably consistent. Toshiba installs the card reader in the front. Maintenance? Nope. It is not even possible to replace the battery on the underside. ...are already filled to capacity with 16 GB. 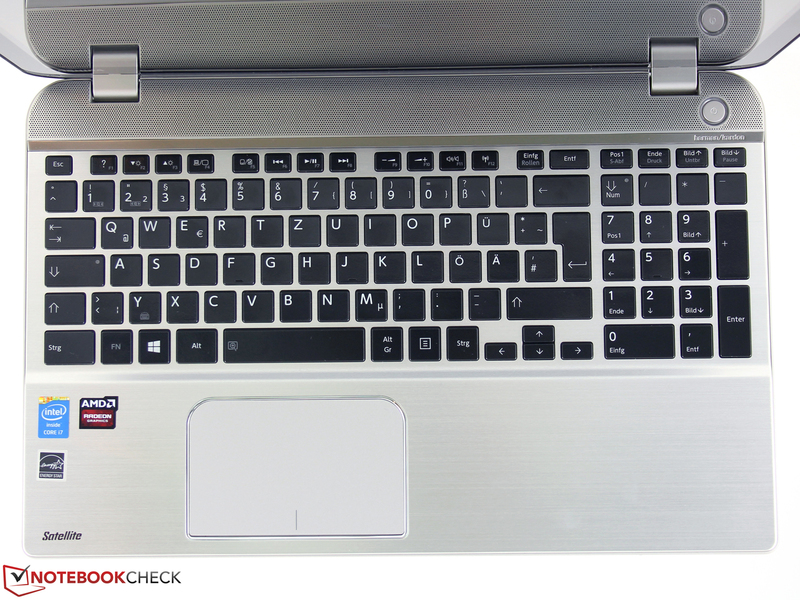 The keyboard's center is a bit spongy, the wide layout and sleek surface nevertheless provide a useful feedback. The power button is very bright, which is distracting in movies or games. Clouding is, if at all, only visible on a black screen and in maximum brightness. 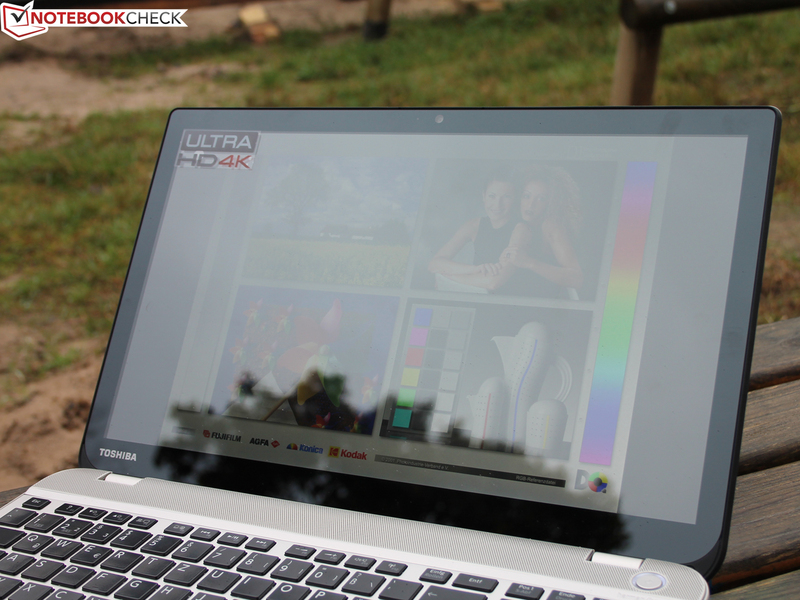 The Satellite P50t-B-10T is not the only device with a 4K resolution. 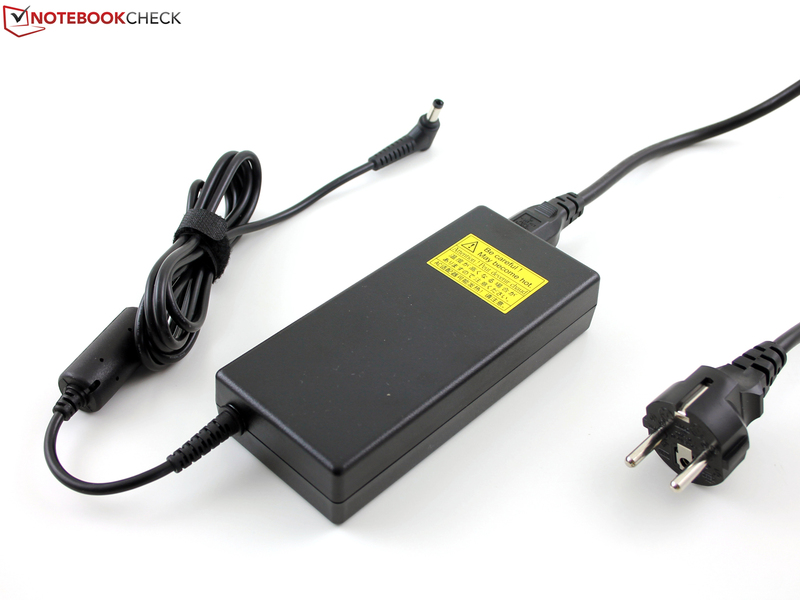 The heavy 555 gram power adapter supplies 120 watts and is never overloaded. 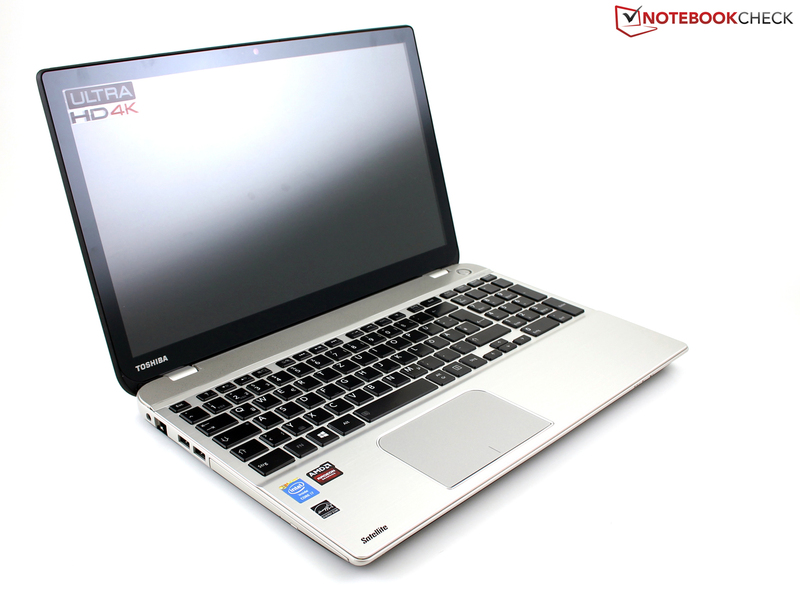 Toshiba Satellite P50t-B-10T: the brightness throttles in battery mode. 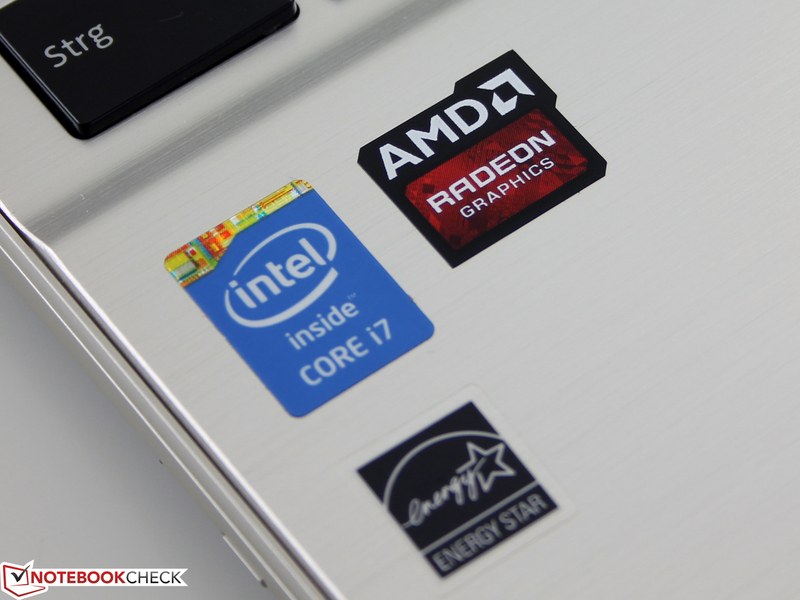 Toshiba Satellite P50t-B-10T: AMD's Radeon R9 M265X is too weak for FHD and 4K. 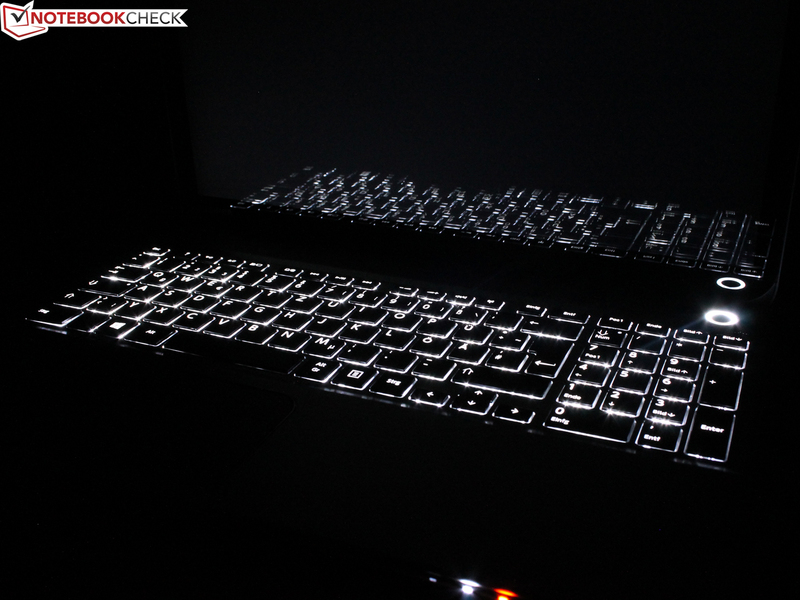 Toshiba Satellite P50t-B-10T: the keyboard is illuminated. Toshiba can justly take pride on screen competence here. The awesome resolution is one thing, but the colors could not be more beautiful. 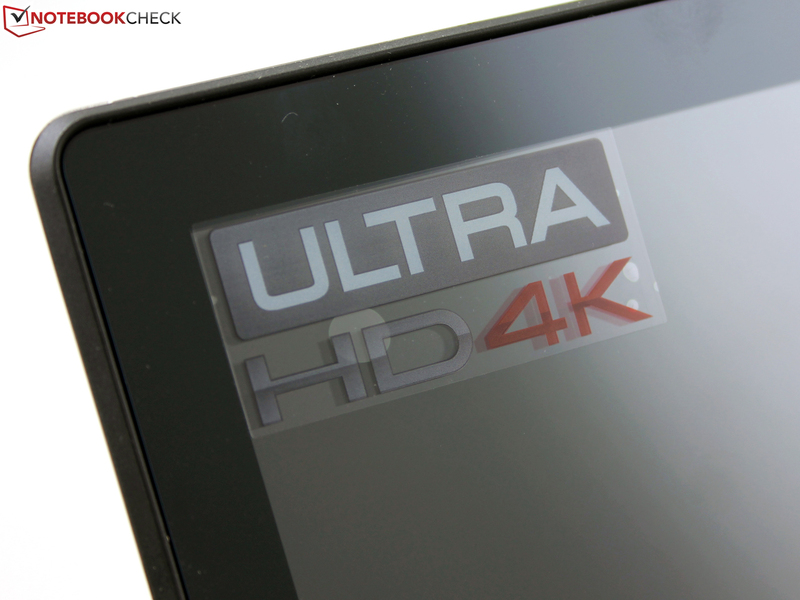 The 4K screen outshines all comparison devices from the same price range especially with its very good color accuracy. Runtimes like we know from other high-performance machines. Toshiba should have combined an mSATA or M.2 SSD with an HDD for this price. A rare thing: The brightness is throttled to 117 cd/m² in battery mode, and no setting can prevent that.